The Volvo V70 is all-new for 2008. Completely redesigned, the 2008 Volvo V70 is smoother, quieter, and better than ever. Volvo's flagship wagon, the V70 has endured the tides of automotive taste, which for years have ebbed away from minivans and station wagons as those seeking family-friendly transportation turned to bigger, heavier SUVs and crossover vehicles. Yet if Volvo can boast a following, it's with brand loyalists who have held steadfast to its wagons for more than 50 years. They're as faithful a bunch as any, with good reason: The V70 is a comfortable, practical, nicely finished car, with a lot of utility, and it's pleasant to drive. The V70's staying power is due in large part to the emphasis Volvo has always placed on safety. This is a costly strategy that has come at the expense of style, pricing and interior materials. For 2008, Volvo's emphasis on safety is stronger than ever. The third-generation V70 comes standard with an array of features designed to protect its occupants. Among them: advanced-technology airbags, whiplash-reducing seats, new-generation electronic stability control and the latest anti-lock brake system (ABS). New safety options include a blind spot warning system, a collision mitigation system that preps the safety gear in advance of a pending crash, and two-stage child booster seats with adaptive seatbelts. The most refreshing news for 2008, however, is that Volvo has injected its big wagon with a healthy dose of Scandinavian style. It starts inside, with what might be Volvo's best interior yet. It's quite sophisticated and we think it's fantastic. The layout of the various controls is smart and immediately accessible, and the ease with which the driver interacts with the car trumps most of its European competition. There's seating for five, with a 40/20/40 split rear seat and flat-folding front passenger seat that allows for a very flexible cargo space. With the rear seats folded flat, the 72.1 cubic feet of available cargo volume surpasses what you'll find in many SUVs. On the outside, the V70 is not a radical design departure; Volvo loyalists wouldn't have it. Instead, it maintains its familiar box silhouette, ensuring the car remains identifiable from 200 paces. But the details have been tweaked. The face is more defined than in the previous model, marked by a larger grille and bigger headlights. In back, the rear glass slopes forward slightly, with giant brake and taillights that no one will miss. The new six-cylinder is considerably more powerful than the previous V70's standard engine. It's much smoother and more refined than the five-cylinders of the past. It delivers power more evenly. The automatic transmission works well, responding to orders from the gas pedal in short order, and the package delivers solid acceleration. The new V70 is the smoothest, quietest Volvo wagon ever. Those looking for a bit of off-road capability might opt for the rugged new XC70, virtually identical to the V70 in design but featuring standard full-time all-wheel drive, increased ground clearance and brush-friendly lower body cladding and protective skid plates underneath. In the daily grind through the suburban jungle, however, the V70 is the better ride. The 2008 Volvo V70 wagon ($32,465) comes with a new 3.2-liter inline-6 rated at 235 horsepower and 236 pound-feet of torque and a six-speed Geartronic automatic transmission. Standard features include fabric upholstery, an eight-way power driver seat with three-position memory, dual-zone automatic climate control, 160-watt AM/FM audio with single-CD and eight speakers, a leather-wrapped tilt/telescoping steering wheel with cruise and audio controls, auto-dimming rearview mirror with compass and remote garage door opener, fog lights, a fold-flat 40/20/40 split rear seat with a locking cargo-floor storage bin and a fold-flat front passenger seat that considerably increases cargo flexibility. The standard wheels are 16-inch alloys. The Premium Package ($2,995) includes a power glass sunroof, leather seating, a power passenger seat and walnut or walnut-root trim. The Convenience Package ($1,395) adds front fog lights, power-operated tailgate, front and rear park assist, a humidity sensor for the climate control system, an air filtration system, dark tint rear windows, and a grocery bag holder and 12-volt power outlet in the cargo area. The Climate Package ($725) includes heated front seats, headlamp washers, heated windshield washer nozzles and Rainsensor windshield wipers. The Volvo Navigation System ($2,120) uses DVD-based map data with driver controls on the steering wheel and remote control. The rear-seat DVD system ($1,800) adds two seven-inch LCD monitors in the front headrests, with an auxiliary jack for video games or cameras, wireless headphones and remote control. SIRIUS satellite radio comes with a complimentary six-month subscription ($295). Stand-alone options include active bi-xenon high-intensity gas discharge headlights ($800), bright silver roof rails ($300), 17-inch alloy wheels ($475) and metallic paint ($475). Safety features include multi-stage front-impact airbags and curtain-style head protection airbags for all outboard seats. The front passenger side-impact airbags have two compartments: a lower one for the hips, which can handle more force without injury, and a second one that deploys more gently around the shoulders. Volvo's latest generation Whiplash Protection Seating System (WHIPS) is design to minimize neck and back injuries in a significant rear impact. Dynamic Stability and Traction Control (DSTC), the latest-generation anti-lock brakes (ABS) and a tire-pressure monitor are also standard. Integrated child safety seats are built into the rear outboard seats, and can be adjusted specifically to the child's size. This optimizes the seatbelt geometry regardless of the child's stature. The safety belts have specially adjusted force limiters to reduce the risk of restraint injury, and the side-curtain airbags are lengthened for better coverage. The new V70 also features a few new safety options. Volvo's Blind Spot Information System, or BLIS ($695), is one of the original systems designed to warn the driver of approaching vehicles that might not be visible in the mirrors. Adaptive Cruise Control with Collision Mitigation by Braking ($1,695) uses the radar-managed active cruise control to warn the driver of a possible collision. The system issues a warning if the V70 is closing quickly on an object and pre-loads the brake system, and it can actually engage the brakes if the driver fails to respond. The Personal Car Communicator ($495) adds keyless starting. More to the safety point, it allows you to determine from anywhere whether you locked the car, though you'll have to call your spouse or friend to lock it for you if you are already on the plane, because it can't actually lock the V70 out of range of the remote. This device also allows you to tell if the car has been tampered with as you approach it in a dark parking lot, and includes a heartbeat sensor to determine if there is a villain lurking inside. For 2008, nearly everything in the Volvo V70 has changed, from its engine to the interior to the basic architecture of its chassis. Exterior dimensions have changed with everything else. The V70, along with the XC70, is now built on what Volvo calls its large car platform, which was introduced with the 2007 S80 luxury sedan. The previous V70 shared its underpinnings with the intermediate S60 sedan. The important point is that the V70 now has more in common with the line-topping S80 than the mid-size S60. And given that it shares a larger car's platform, it might seem odd that the 2008 V70 is nearly a foot shorter than the 2007 V70. Its wheelbase, however, increases about two inches to 110.8. The result is more room inside while taking up less parking space outside. Overall, the 2008 V70 is a bit shorter but wider than a BMW 5 Series wagon. It's slightly lighter, too, despite a 231-pound increase in curb weight compared to the 2007 V70. The 2008 V70 weighs 3,527 pounds. The V70 body was developed with Volvo's usual attention to impact-dissipating crumple zones, and it features fully laminated glass. The styling is Volvo evolution, but the 2008 V70 is smoother, less gangly and visually tighter than the 2007 V70. In profile, the character line at the bottom of the windows rises a bit more dramatically, creating a more forward leaning, dynamic stance. The rear glass now angles forward toward the front of the car, rather than dropping cliff-like from the back edge of the roof, yet there's still there's a bit more cargo volume inside. The headlights and grille are larger, a bit more angular and more prominently defined. From the rear, the V70's hexagonal shape reminds us of Volvo's new, small C30 coupe. The tail lights are very big and bright enough to startle in the dark, and the rear glass window extends down lower than the side windows to improve rearward visibility. The optional, hydraulically operated power tailgate is handy if you approach the back of this car with arms loaded, and it keeps hands cleaner if the tailgate is coated with grime. The Volvo V70 cabin is the company's best interior yet. It's understated, elegant and nicely polished. Materials and overall finish are high-grade. While its interior borrows heavily from Volvo's line-topping S80 sedan, taking both design themes and components such as gauges, switches and console, the V70 interior has its own feel. Safety was a priority. With the 2008 V70, Volvo refined its whiplash-limiting seat design, called WHIPS. During a rear-end impact, the seatbacks move rearward to reduce acceleration forces on the occupant's back and neck, while the headrest pushes forward and upward slightly to meet the neck and head as they are thrust backward. The V70 driver sits before a fat, leather-wrapped steering wheel, looking at big, crisp gauges with bright-white backlighting and number gradients that are easy for the brain to absorb. The standard trim is etched aluminum, but the optional walnut and walnut root are gorgeous. The overall effect is very Scandinavian. The coolest element may be the thin-panel center stack. It's no more than two inches thick, with open space behind it. Most controls are placed here, with audio above climate and a display at the top, arranged in a neat, symmetrical pattern. The primary knobs are big and raised substantially from the surface, and the airflow controls are fashioned in an icon shaped like a seated person shaped icon, so there's absolutely no confusion about directing air toward the face, feet or windshield. It's all quite clean and pleasing. Most significantly, measured by function and simplicity of operation, the V70's various controls are better than most other luxury brands, and particularly German brands, which still insist on layering more menus in their interfaces while adding more buttons. This might be enough reason for some to choose Volvo. The navigation system is new, and promising. The screen pops up vertically from the center of the dash, though it's canted forward at what seems like a strange angle. The driver surfs through menus and makes choices with buttons on the back of the steering wheel spokes, almost where you'd expect paddle shifters for an automatic transmission. Our initial reaction is that it's better than other systems (unless, of course, you absolutely need those paddle shifters). The menus are no more difficult to learn, and they're managed without taking hands from the steering wheel and fishing for the controls. Passengers can control the system with a remote. The seats are excellent. It's hard to find a better mix of comfort and support for daily driving. The optional leather upholstery is smooth and stretched tautly over the front seats. Ventilated cool seats are optional. The value of the fold-flat front-passenger seat should not be underestimated as it allows hauling of long items, such as a ladder or a nine-foot fly rod rigged and ready to move to the next spot upstream. The design seems to do nothing to diminish the seat's comfort, yet its back can fold forward to a level on the same plain as the folded rear seat and cargo floor. In-cabin storage tends to be short in modern Volvos, though it's decent in the V70. The center console and glovebox hold quite a bit of stuff. The pockets behind the front seatbacks are handy and the cupholders work well. The rear seats are not the roomiest, given the apparent size of the vehicle. We wouldn't recommend six-footers sit back there for a cross-country trip. However, there is enough room that someone 5-foot, 9 inches won't get claustrophobic or cramped riding across town, and we think it would be fine for families until the kids are well into their teens. The rear DVD system puts a screen in the back of both front headrests, which we prefer to those that drop from the headliner. The all-new 2008 Volvo V70 makes a compelling alternative to a crossover or sport-utility vehicle. It's Volvo's best wagon ever, and it delivers most of the utility one gets in a moderately sized SUV. It provides good passenger-cargo flexibility and more cargo volume than some mid-sized SUVs, but its exterior dimensions are relatively compact, and it's easy to park. It can tow a camper (up to 3300 pounds), but it gets decent gas mileage. It's more pleasant and comfortable as daily transportation than most any SUV (or crossover) we can think of, with a smooth, quiet and comfortable highway ride. The 2008 V70 features a new six-cylinder engine. Gone are the familiar five-cylinders. This 3.2-liter inline-6 was first used in the 2007 S80 sedan. It generates 235 horsepower at 6200 rpm, with 236 pound-feet of torque at 3200 rpm. That's an upgrade of 27 horsepower over the 2007 V70 2.5T (though far short of the sporty 2007 V70 R's 300 horses, of course). The new V70 engine uses the latest in control and materials technology, including emissions-reducing variable valve timing. The six-speed automatic transmission boasts one more gear than the previous model to improve response and fuel economy. This transverse, or sideways, mounted engine is compact, which helps explain why the 2008 V70 is nearly a foot shorter than the previous model, even with more interior space. Volvo's new six-cylinder reminds us why we like inline six-cylinder engines, or straight sixes as they're known. They just seem to power-up faster than the more common V6, spinning more freely and smoothly as they go. Volvo's 3.2-liter doesn't qualify as a screamer, but it delivers acceleration-producing torque in smooth, linear fashion and breathes well at high rpm, which means it doesn't gasp or get rough if you run it near the redline. From a stop or for passing at higher speeds, the V70 accelerates better than adequately, and the eager quality of its engine might make you actually want to shift the six-speed automatic manually as you go about your business. No need to do so, however. Volvo's Geartronic transmission is probably its most effective automatic so far. It seems to shift in all the right places, and whether it's up a gear or down, those shifts are smooth, tight and relatively quick. The Geartronic manual feature can be enjoyable nonetheless, should the driver choose to get a bit more involved. There are no paddle shifters behind the steering wheel, as many cars now feature (that's where Volvo put controls for its navigation system), but there's a manual slot for the shift lever left of the normal gear-selection path. The up-down gear change action has a smooth, quality feel, and the transmission won't insult the driver by shifting up on its own if the revs get too high. We suspect Volvo will bring its V70 T6, with a more powerful turbocharged version of the six-cylinder and a manual transmission option to the United States for 2009 or beyond. But the V70 as it's currently available didn't leave us pining for the turbo, nor given the excellent performance of the automatic, for a manual. It's not a machine that makes you crave more sporty features. If pure excitement is what a buyer seeks, he or she might do better with the more powerful, much more expensive wagons from Audi or BMW. Yet the V70 never gets tiresome around town or on the open road, as some sport-utility vehicles can. It rides comfortably and quite smoothely, though it's never mushy, and its seats make a fine place to de-compress during a long commute home. The V70's brakes are superior to most. They stop the vehicle right now, with Electronic Brake-force Distribution (EBD) to instantaneously transfer the most stopping power to the tires with the best grip. Volvo has nearly eliminated the spongy feel that characterized its brake-pedal action for years. 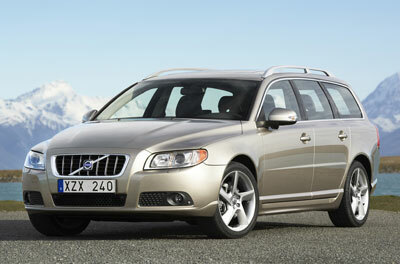 The 2008 Volvo V70 wagon is all-new, and the best wagon Volvo has produced to date. It's solidly built, with top-drawer safety features and fantastic interior design and finish. While the V70 isn't as exciting to drive as some other European sport wagons, it's quiet, maneuverable and pleasant for the sort of driving most of us do most of the time, which means carrying ourselves, our kids, our pets and things through the urban landscape. The V70 has a six-cylinder engine (as opposed to five) for the first time, with a more efficient six-speed automatic transmission. The package is silky smooth. The V70 retails for considerably less than other similarly sized European luxo-wagons, and it gets better mileage than many SUVS with similar interior space. For many buyers, it's probably the more rational choice. J.P. Vettraino filed this report to NewCarTestDrive.com after driving 2008 V70 models in Germany and Detroit. Head/hip/leg room, f: 38.8/54.8/41.9 in. Head/hip/leg room, r: 38.6/55.1/34.6 in.